Right before Eid I made two banana breads for the office: one with butter, lemon and yogurt, and this one with yogurt and chocolate chips. Both were assembled based on the bananas and yogurt I had to use up, and both were very nice! The chocolate chips were courtesy of my American flatmate, and much appreciated: otherwise coconut chips or nuts would have been nice too. Though I am not a banana fan, they come my way (canteen desserts, office coffees) and are good and plentiful here, and they do freeze well unpeeled. As our next chest freezer is already full (mainly due to ant invasions), I thought banana breads were a better destination for these. Preheat the oven to 180C. Line a medium loaf pan with parchment paper (mine is maybe 20x5cm). Whisk together eggs, bananas and oil. Whisk in the rest, and stir in a handful of dark chocolate chips or chopped baking chocolate. Bake at 180C for 50-55 minutes or so. I test with a wooden chopstick, this one took a bit longer than the lemon cake. This would probably be faster if not baking two cakes at same time. Cool on a rack for a bit before serving (easier to slice next day). Here are the two banana breads, lemon and chocolate chip, freshly baked. Watched with an episode of Alias season 1, which is still enjoyable! We have not paid for DSTV here, but not having actual TV is fine as long as you have hard drives and DVDs. I am really really forward to seeing Jennifer Garner in Peppermint. Most movies I watch on planes these days, though we did go see Deadpool 2 recently at Accra Mall, which has a very good cinema. DP2 was gory but very funny. This entry was posted in baking, food, fruit and tagged banana bread, cake, chocolate, pantry challenge on June 23, 2018 by krumkaker. Well, we thought were leaving Accra mid-November….. but travel clearances are taking their time, so life is in limbo right now. As we were assured all was on track, we gave notice on our flat, and the lease runs out in two weeks. I am taking deep breaths and reminding myself that I do have a job next month, somewhere, that we have our health and this will be resolved. Still, this is stressing me out to no end. Short term accommodation is hard to find here, and expensive, and right now we do not know if the delay will be days, weeks or months. …. Crisp but floury potatoes, and slow-cooked lamb, tender and almost melting off the bone, are like the safety of a friend’s hug. Cooking is sorcery. Some days we desperately need its magic. Exactly. World news is depressing, stories of sexual harassment keep coming, and are only too believable. My challenges are small, but some days I just want to curl up in the sofa and watch Gilmore Girls. Well, when all else fails, there is still cooking. I am still emptying fridge, freezer and food stocks, in case by some miracle we move in the next 20 days, and/or if we move to a rented room somewhere. Que sera, sera. Let there be chocolate pudding………. I started with Smitten Kitchen’s Best chocolate pudding, because her recipes are the best. The plan was to use evaporated milk and Italian Hulala UHT whipping cream, as in photo above, but Iwas too distracted to remember that, as I was watching the YouTube Yacht Rock series on my laptop at the same time, which is very funny….. So the pudding was all done with milk powder. The chocolate was Guatemalan, as we are lucky enough to have a friend who works in cocoa. Not enough chocolate left, so I used up the last of our Ghanaian cocoa as well. Ghana is the second largest cocoa exporter in the world, after Côte d’Ivoire, and we get excellent cocoa here. Combine the cornstarch, powdered milk, icing sugar and salt in a medium saucepan, Whisk in the water/milk, and bring to low boil. Add chocolate and cocoa powder, stir well so all is melted and mixed in. After ten minutes or so it will thicken: taste to see how you like flavour and texture. I added an extra pinch of vanilla salt at this stage. Also added: sugar sprinkles on top, as we in are the “everything must go” stage of pre-moving. Cool and eat: this makes at least six servings, even for stressed people, as it was very dark and chocolate-y. Piling up items to ship or give away: there is a classifieds section here in Accra where people sell all kinds of things due to house moves: furniture, used shoes, kitchenware, toys… I never thought I might be one of them, but if we have to store stuff with friends while we are in temporary lodgings, much more will be shedded. Most just given away, I think, it might also help for good karma for the move. And to remind myself to keep this in perspective: another neighbour died, as we could see from the red and black funeral drapings on their gate. We have a lot to be grateful for, so I will keep breathing, waiting and maybe have some more chocolate pudding…. This entry was posted in food, Ghana and tagged chocolate, living in Accra, moving, pantry challenge, pudding on October 28, 2017 by krumkaker. 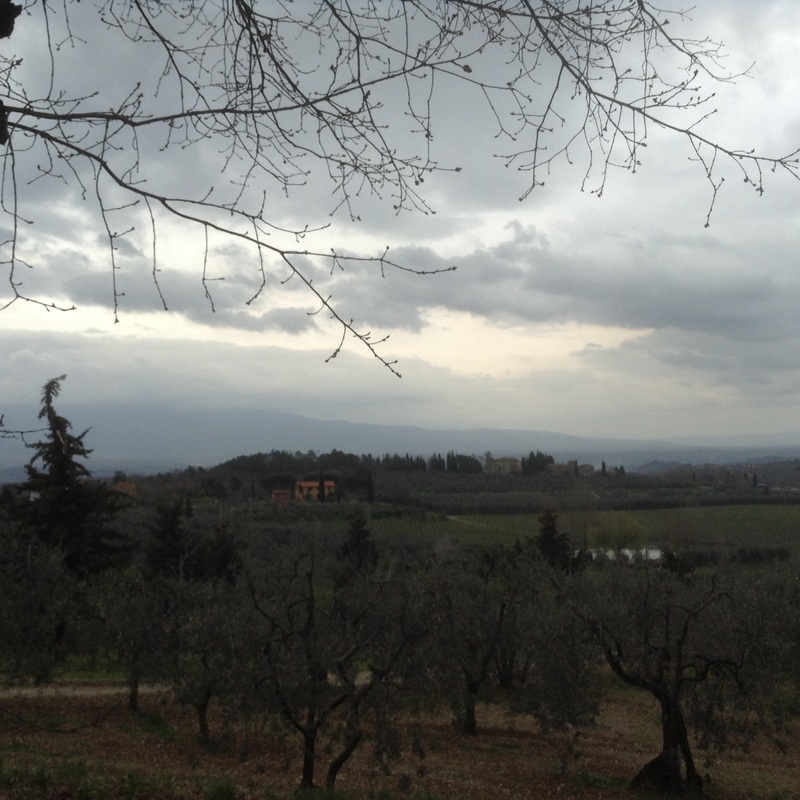 We are in Tuscany for Easter, with rolling hills, olive trees and vineyards, and very wet weather. 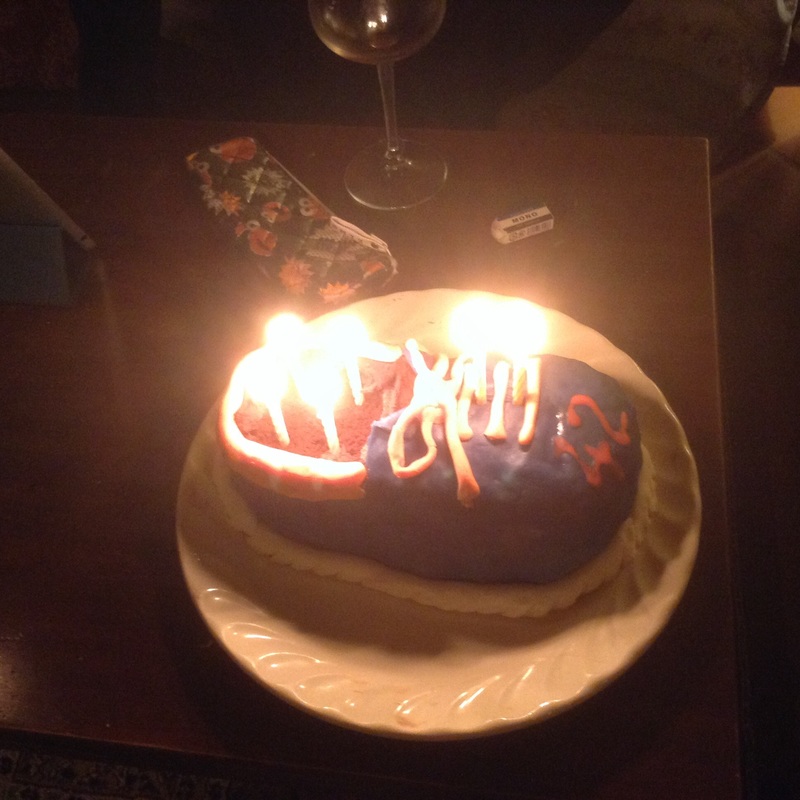 So yesterday we baked a cake, went for a pici con cinghiale lunch, then came back to sculpt the bread into this running shoe for the birthday boy of the group, who just turned 42. 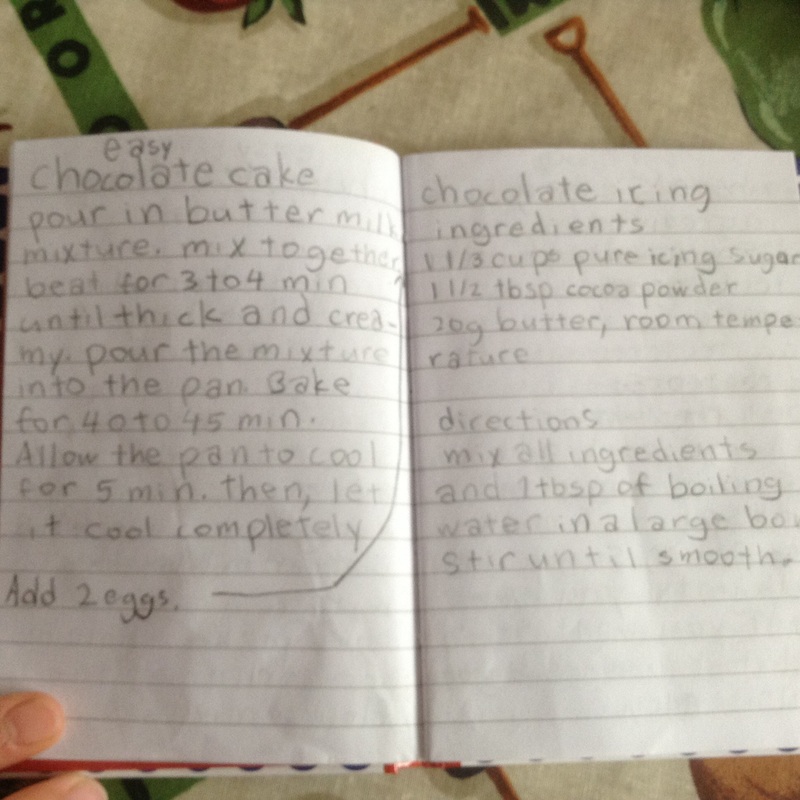 The recipe, as written by our head baker (aged eleven). This was doubled. 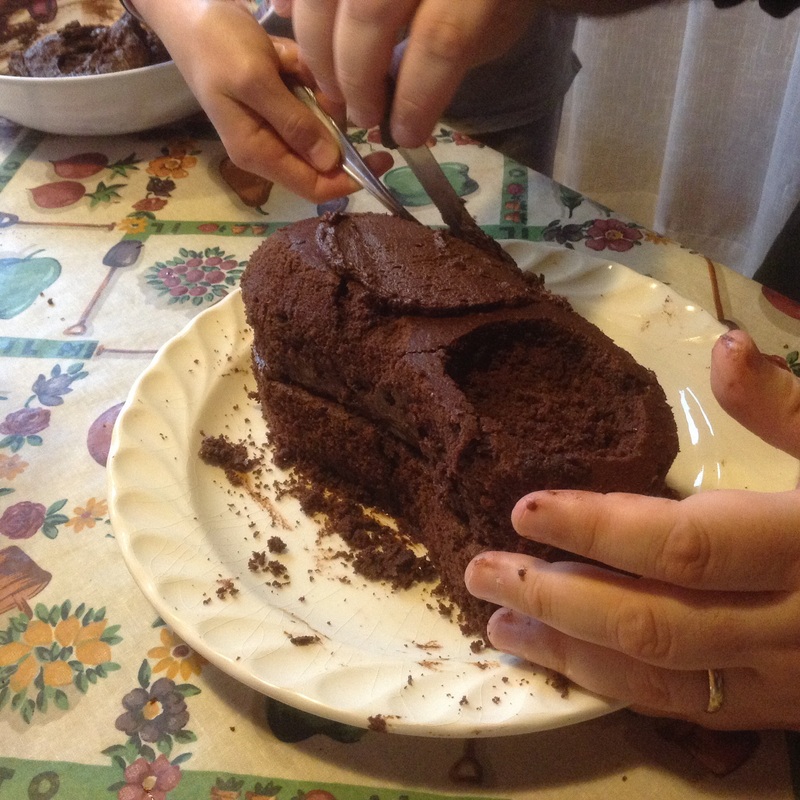 This was baked in a 20x30cm foil tray, so we could cut the cake in half and stack the halves. While cake cools, go for a drive and and admire the rainsoaked view. 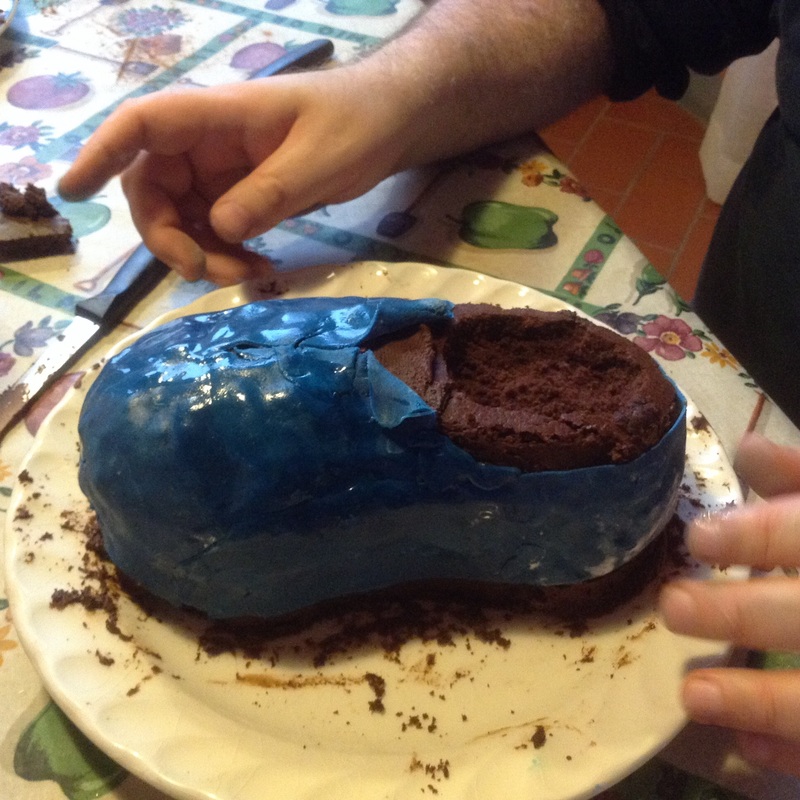 A shoe shape was outlined, we carved the cake halves and glued them with frosting. Blue fondant icing, brought over from the UK. The birthday boy runs marathons and just got a new pair of blue running shoes. 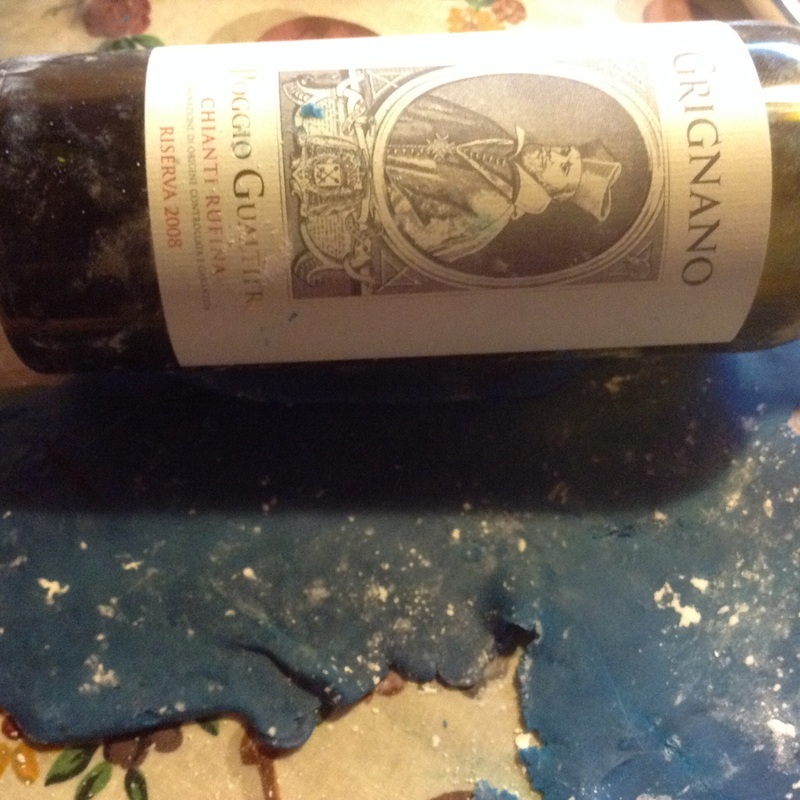 No rolling pins in a holiday house kitchen, but we had Chianti bottles from last night which worked well! The laces were handcolored orange royal icing. 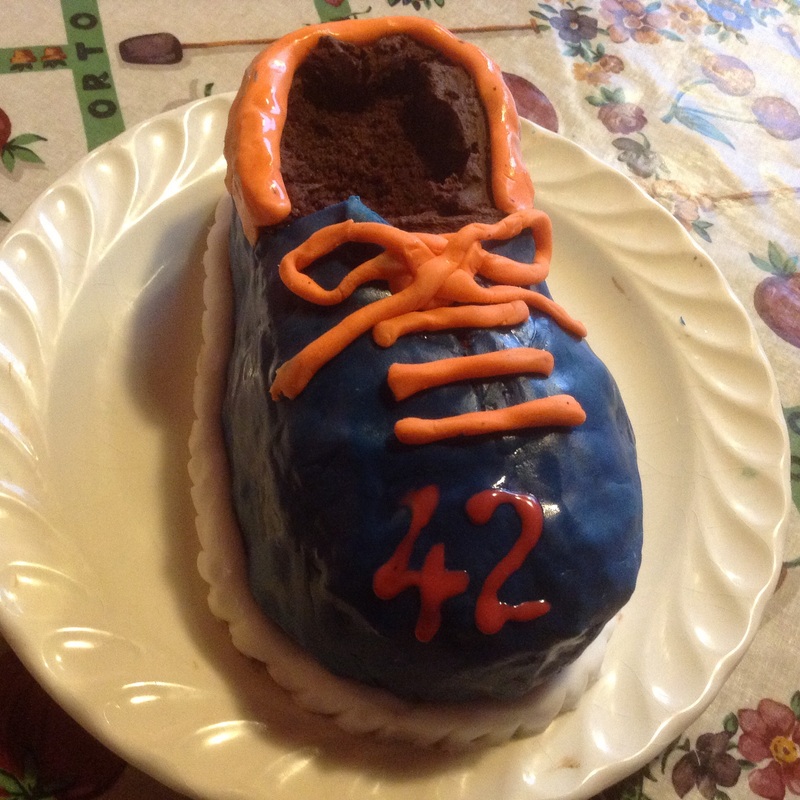 Hey presto, a birthday cake shoe! And we are heading off for Easter lunch soon. Happy Easter Sunday to all! 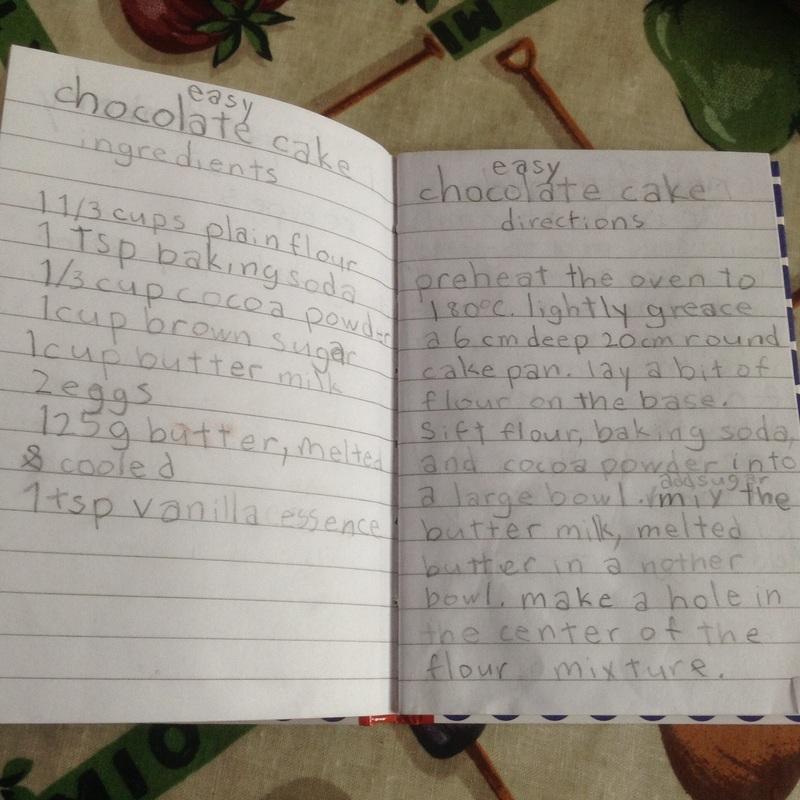 This entry was posted in baking, food and tagged cake, chocolate on April 5, 2015 by krumkaker.